WingerBLOG: 20131201 - Light it up! 20131201 - Up in the am and to the desk to get caught up, L&J out to the store an D&G playing/doing homework. 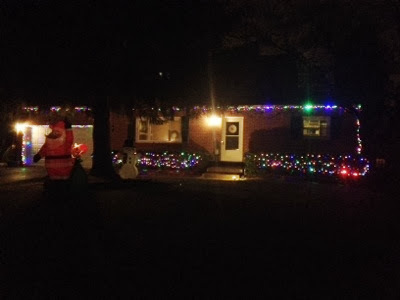 We regrouped for lunch and then DG&I got the Christmas blow-up guys and lights out for the front. The blow-ups still work and we got them set up, but we only had enough for one set of bushes so we made a list and D&I headed out. Our first stop was to pick up a deodorizer for the black car. We swung by the house and got it set up and bubbling. On to the Home Depot where we loaded up on lights. 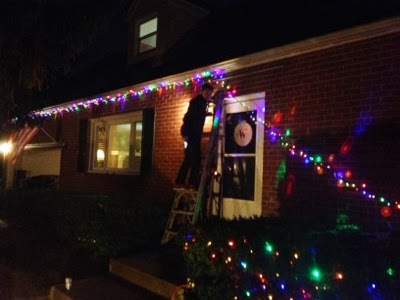 Back home and D got up on the ladder and stapled all the lights up this year (PRAISE THE LORD!!!). L came out to do periodic inspections and we passed the test. 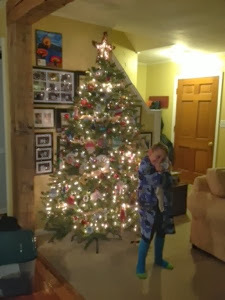 LJ&G got the tree set up inside and the house looks great! In for a bite to eat and then I played cards with J&G until they had to go to bed. D&I to the basement with our friends to watch the mid season finale of the 'Walking Dead'. IT WAS AWESOME!!! I tried to get a bit more paperwork done... To bed in good time.